Pike weighing more than 11 pounds the biggest headliner of day, but more fishermen expected to show up to cash in on fundraiser to benefit food pantry. 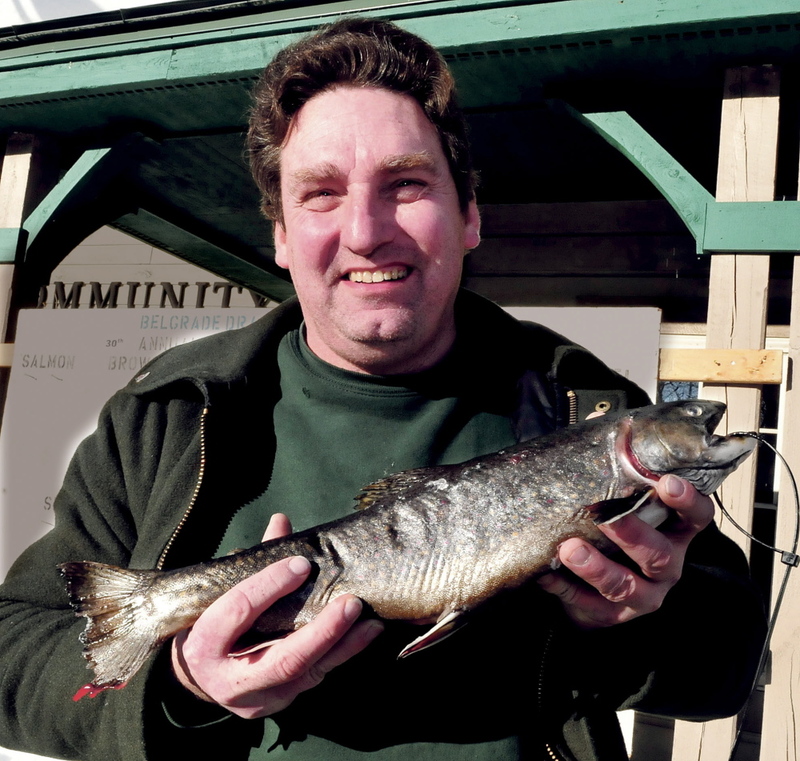 BELGRADE — It took more than four and a half hours and 240 miles, but Charles Colby was determined to get from Clayton Lake in Aroostook County to enter his prized brook trout into the annual Belgrade ice fishing derby. The derby, which is in its 30th year, is put on annually by Belgrade Draggin Masters Snowmobile Club and this year sold about 160 $10 tickets for the annual derby, with cash prizes for the largest salmon, pike, trout, togue, pickerel and splake. By 4 p.m. Sunday, only a handful of fishermen had left ponds and lakes to head to the Belgrade Center for All Seasons for the weigh in. The derby is held on a statewide free fishing day and is open to competitors throughout Maine, as long as they have purchased a ticket for the derby ahead of time, caught the fish on derby day and had it weighed between 2 and 5 p.m. A $500 cash prize is awarded to the largest pike, with $300 for second place and $100 for third. First place in the other fish categories is a $75 cash prize and second place is $50. About 60 percent of the money raised goes to the prizes, while the rest benefits the Belgrade-Rome Special Needs Food Pantry and the snowboarding club, according to club president Lou Ashland. It was about 8:30 a.m. when Colby hooked his 3-pound brook trout in the Clayton Lake territory, about 30 miles from the Canadian border in Aroostook County. It had been about seven years since the Palmyra native had entered the Belgrade derby, and he wasn’t anticipating the four-hour drive this morning. Colby intended on staying in Belgrade until the weigh-in was completed to see if he walked away with first-place in the brook trout category. As for the future of Colby’s potential trophy fish, “My cousin said I better bring it home because we’re going to cook it and eat it,” he said. The headliner of the derby is the pike, however, with a 20-pounder usually taking home first place. 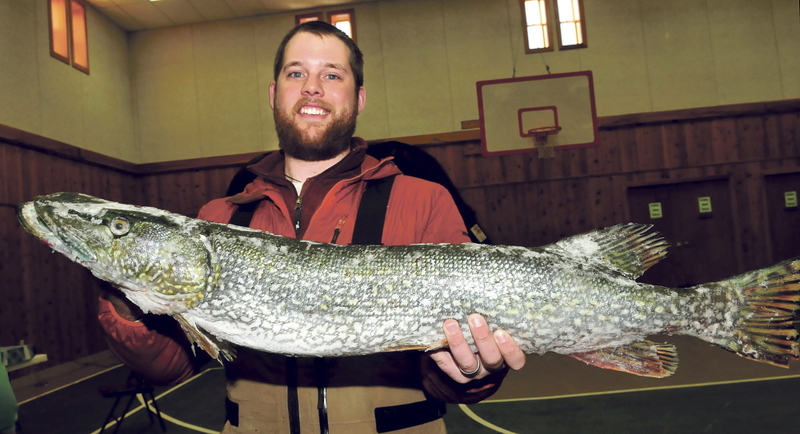 One of the first fisherman at the weigh-in with a pike was Rome native Nick Workman, whose 36-inch, 11 and a half pound pike was the largest weighed in by 4 p.m. Workman, an employee at New Balance, said the fish was caught at Cobbossee Lake in Winthrop and was caught at about 2:30 p.m. While Workman’s catch ultimately may not be big enough for first place in the competition, it will still be put to good use. “Someone at my work said they wanted it and will eat it,” he said.